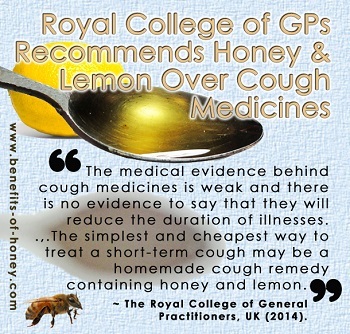 It certainly came as an utter surprise when a leading body of doctors in the United Kingdom, the Royal College of General Practitioners made news in mid Oct 2014 by declaring that cough medicines were a waste of money, and that it was better off making your own cough mixture at home with honey and lemon. I had assumed that only homeopathic doctors would recommend honey home remedies and had never expected that those doctors would actually dismiss an over-the-counter health medicine that is worth £3 billion in sales every year. 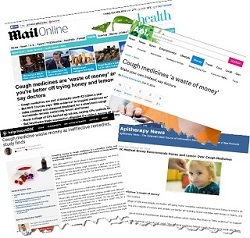 "The medical evidence behind cough medicines is weak and there is no evidence to say that they will reduce the duration of illnesses - as such, GPs are unlikely to prescribe them." He also backed the NHS Choices website, which advised, "There's no quick way of getting rid of a cough caused by a viral infection. It will usually clear up after your immune system has fought off the virus... The simplest and cheapest way to treat a short-term cough may be a homemade cough remedy containing honey and lemon. The honey is a demulcent, which means it coats the throat and relieves the irritation that causes coughing." Previous studies that supported the claims of effectiveness of cough mixtures were deemed as low quality. It was reported that many cough syrups contained high doses of sugar, with one week's dose of some syrups containing as much sugar as five Mars chocolate bars. It is also known that most cough medicines contain dextromethorphan (DXM), an active ingredient that is psychoactive (mind-altering) when taken in higher-than-recommended dosages. "OTC products on the UK market have successfully demonstrated their efficacy through decades of use by millions of consumers, and their acceptance by the MHRA, which independently reviews the clinical evidence, means people can continue to rely on them when treating themselves and their children." But I still wonder why general practitioners would deliver such a damning blow to the pharmaceutical industry when they are paid for writing prescriptions of medicines supplied by Big Pharma. And has the RCGP has ever refuted the efficacy of cough mixtures before? Is this their first open dismissal of these medicines in decades? Are we expecting a new alternative drug to dextromethorphan? 2. Buckwheat honey, nature's superfood, is considered as one of the best medicine for cough. Read: Why Eat Buckwheat Honey? End of "Honey and Lemon Recommended Over Cough Medicines". Back to "Tastiest Home Remedy For Cough: Honey".